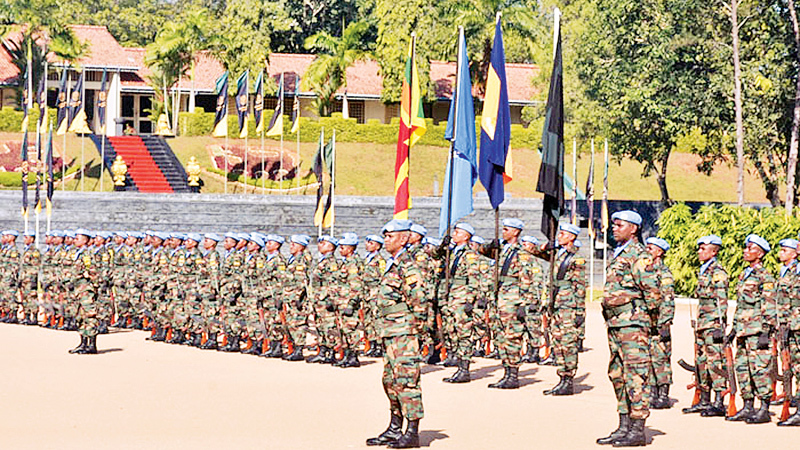 The first segment of Lebanon-bound Sri Lanka Army's 12th Force Protection Company (FPC) for the United Nations Interim Force in Lebanon (UNIFIL) left the island on Sunday to assume their roles and tasks in the UN Peacekeeping Mission in Lebanon. The first advance party of the FPC contingent (Two Officers and Fourteen Other Rankers), out of a total of 150, belonging to 13 Regiments of the Army, thus left for Lebanon to serve a period of one year in the United Nations Interim Force in Lebanon (UNIFIL). Major General Piyal Wickramaratne, Commandant, Sri Lanka Army Volunteer Force and Colonel of the Regiment, SLSR, a few days ago met this contingent and spoke to them at the SLSR Regimental Headquarters in Ambepussa. The full contingent is comprised of 10 Officers and 140 Other Rankers, made up of troops from the Sri Lanka Sinha Regiment (SLSR), Sri Lanka Engineers (SLE), Sri Lanka Signal Corps (SLSC), Mechanized Infantry Regiment (MIR), Commando Regiment (CR), Special Forces (SF), Corps of Engineer Services (CES), Sri Lanka Army Service Corps (SLASC), Sri Lanka Army Medical Corps (SLAMC), Sri Lanka Electrical and Mechanical Engineers (SLEME), Sri Lanka Army Ordnance Corps (SLAOC), Sri Lanka Corps of Military Police (SLCMP) and the Sri Lanka Army General Service Corps (SLAGSC). The second contingent will leave for Lebanon shortly and the final batch is expected to leave the island on March 6.